Once my Jedi sentinel turned 19, I felt like it was time for a change. I brought a smuggler to level 12 on a different, highly populated server. I also had been playing an imperial agent in beta, but only to level 10. The smuggler story line was kind of dull, having to chase down my lost star ship and the companion was some geek, who gave his weapons names. The imperial agent background sounded more fun. Constant paranoia, a trigger happy, anarchic and ruthless bounty hunter as a companion and the option to throw a couple of monkey wrenches into the imperial secret service wheels certainly has more potential. Playing a smuggler/agent comes easier to me. They usually take cover and start shooting. Throw some explosives here or there and stab, if the opposition gets to close. Damage output is paced by your energy levels, which slowly dwindle and once they are gone, you have only a few basic options and a recharge with a 2 minute recast timer. You have a few more options for crowd control, some dots and a snare. Perfect. Seriously. Smugglers and imperial agents are damage classes. The advanced classes of smuggler/ scoundrel and imperial agent/ operative can be specced as healers or as melee/ midrange damage dealers. Gunslingers and snipers are the other options for advanced classes who deal damage from a distance, and nothing but damage. Although I like melee, healing is not my thing and the outlook of building a sniper/ tank duo with Kaliyo outweights my preference for melee. 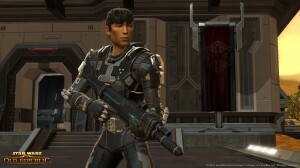 One more thing I like about the Empire side: I can play a Chiss. Blue in the face and no need for beards or tattoos. One annoyance comes with the IA fun: The UI preference settings are buggy. By default, the UI switches between a standard and a cover bar for the main hotkeys. But I never could get used to that on WOW, nor will I opt for it here. You can switch it off using preferences, but it does not save your settings. It resets to the default every time an instance is reset. That happens after you die, when you leave a flashpoint or when you just switch instances to join your fellow group members. I’ve gotten myself killed right after a reset, where I just couldn’t make sense of my hotbar. 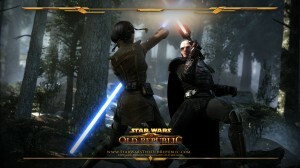 I’ve bugged this already and might end up posting it on the SWTOR forums as well. In this series of articles I want to describe what classes I’ve played, what I liked and what I didn’t like. Just let me remind you ahead of time, these are my likes and dislikes. Others will enjoy and master certain aspects and mechanics of the game much better than I do and others will hate my favorites. It’s really not an opinion on quality of the game. The quality of the game comes from presenting at least one or two ways a particular user can enjoy the game. There’s one more thing that should be mentioned beforehand: I prefer melee over ranged and magic in games like World of Warcraft or Everquest 2, with the WOW hunter being the positive exception. I also prefer dps over healing and I have been seen tanking with my death knight. How this actually translates into my favorites for TOR remains to be seen. A Jedi Knight was the first character I played in one of the beta weekends, but I did not return to them, favoring the Sith Warrior because of their companion Vette. Vette is certainly more interesting than T7-O1. As for the mechanics, a knight or warrior plays pretty much like a WOW rogue or Rift warriors and rogues. You build up to 10 points of focus through some abilities and spend the focus through some more abilities. 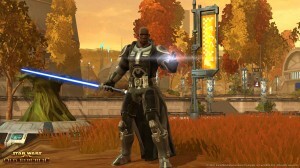 Once you have picked your advanced class, you also gain centering (Jedi) or rage (Sith). Once you reach 30 units, you can enable a new powerful, but temporary buff. I don’t like having to watch short term buffs all the time, but that’s the way it is set up and it hasn’t been to much of an annoyance, yet. As advanced classes, I picked a Jedi Sentinel. Jedi, because for a main character, I want to have alignment and faction match with republic and lightside and playing darkside as a Sith gives you some truly ugly choices. Taking the advanced dps class of Sentinel seems to be the easier choice as well. And it will be just more fun. If I end up creating a tank, it will be a trooper or bounty hunter. As I’ve been playing a multitude of characters, one thing became obvious to me for all classes: There are probably to many abilities to be arranged in a tidy manner on the keyboard and the hotbars. At level 19, both center hotbars are full and grouped in a halfway decent order: focus builders / openers, finishers and others. From this point on, any new ability will create more chaos. I have been playing Star Wars for almost 2 weeks now and managed just yesterday for one of my characters to turn level 19. At first sight, that’s not much of an accomplishment, but if you continue reading, understandable. You see, the Star Wars MMO has 4 classes on each side of the war to pick from. That makes 8 origin stories in 4 distinct areas. And that’s not even adding in the advanced classes. Those 8 origin stories want to be explored and the class mechanics want to be tested. Until I can finally settle into one and say: That’s it, that’s the one. I got close last night when my Jedi Sentinel turned 19, but then I rolled a Chiss Imperial Agent and had lots of fun with him. And that’s what happened since start: Play a class for a while, get bored or annoyed with the mechanics or just think the next class might be even more fun. Part of the problem are those 8 origin stories, one for each class/faction combo. Two classes share the same starting planet which therefore adds 4 more sets of local quests, which add atmosphere and local color to the class quests. The class quests lead you to level 10 and introduce your first companion to you as well as your first customizable class weapon like the light saber. Each starting planet has between 1 and 4 heroic quest areas or instances. After that, you are sent to your capital planet with a stopover at the fleet. There, you decide what advanced class you pick and what crew skills to choose. You also have the option to run your first flashpoint group instance. The story and quest lines for each specific class continue on the capital planets for each faction. And again, local quests are shared between the classes for added color. The class quest lines come in 3 consecutive sets, each leading to a different area of the planet and each leading to 1-3 heroic local quests. Once that is done, you’ll own a star ship. My jedi knight got his from a general who needs help, and other classes will find ways to get a star ship as well. Once aboard the star ship, you are introduced to space battles which start around level 20. Your storyline continues on 2 more planets, with quests starting at level 18 for one planet and level 20 for the other. Here’s where my experience ends for now. I will follow up with more info on the story lines and more details on the class mechanics, which will ultimately make me pick my class. Perhaps.